Prerna Lau Sian is a Barrister (NP) working for a large American Investment Bank in Regulations. She has significant media experience broadcasting on Nusound Radio 92FM and presenting for BTVI. Prerna is also the Assistant Editor of India Link Magazine International and the European Correspondent for the Organiser Magazine where her articles focus on politics, international relations and human rights. 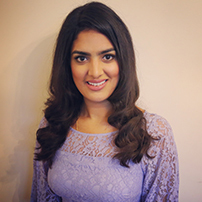 In addition to her media roles, Prerna has a keen interest in politics and has previously stood for Councillor and worked in the House of Commons. She regularly speaks and comperes at high profile events and is the Vice President for Women and Youth at the UK Asian Business Council.